Blog privacy controls who can and can’t view your blog. Two public blog options – allows any one who visits your blog to read your blog content. Three private blog options – restricts who can view your blog content. “Discourage search engines from indexing site,” is the only privacy option available to free users. Other options are only available to Pro users. Please note RSS is automatically disabled on all private blogs to ensure your content is restricted to only people who should be able to read it. 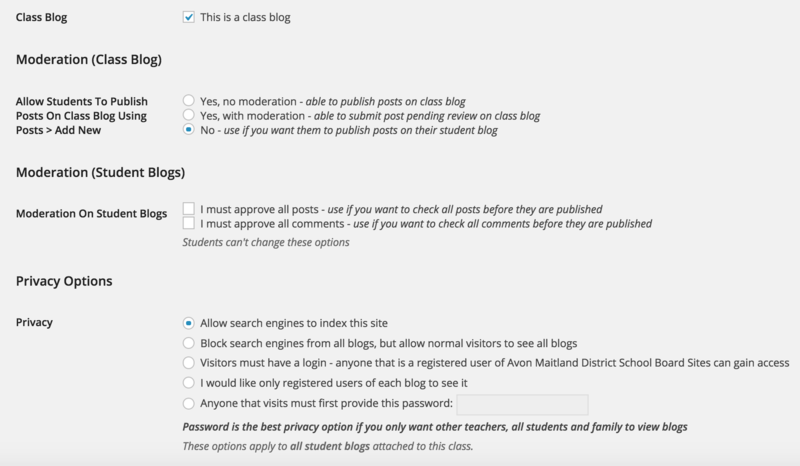 You control the privacy on the class and student blogs using My Class > Settings. Be sure you have checked the box, This is a class blog before selecting your class blog settings to ensure that your settings are applied to all student blogs. This is the default setting for all newly created blogs. It allows any one to read the content of your blog and for your blog to be indexed by search engines such as Google. This allows any one who knows your blog URL to read your blog content while blocking web crawlers so that your blog is not indexed by search engines such as Google. You use this option if you want to keep your blog public so your content can easily be read but want to limit it to only people who know your blog URL. There are three different private blog options. 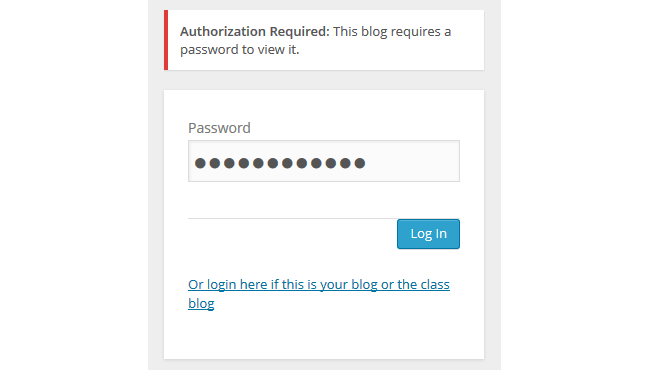 Edublogs recommend you use “I would like anyone who provides the following password have access to all blogs” if you want to make your blog private, but make it easy for students, parents and other teachers to view your blog. 1. Visitors must have a login – anyone that is a registered user of Avon Maitland District School Board Sites can gain access. 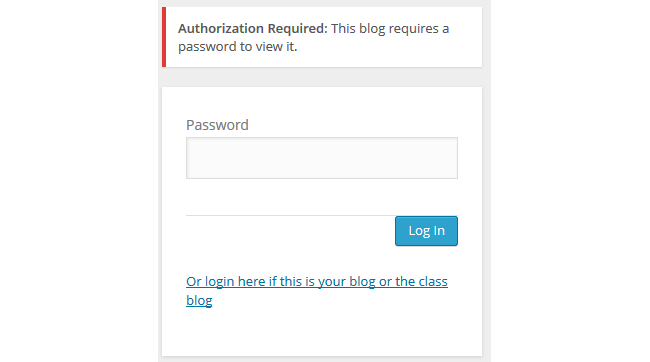 This allows anyone in AMDSB who is logged into their Edublogs.org account to view your posts. 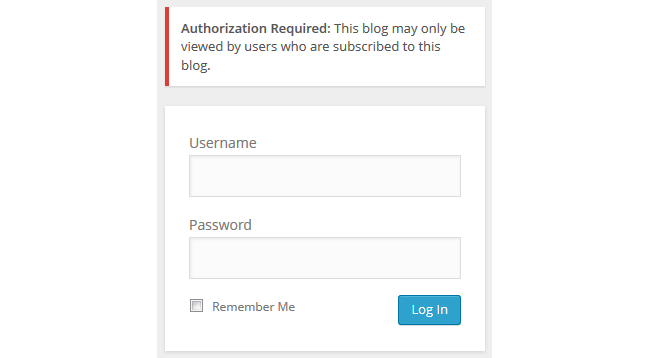 People visiting your blog will see the following notification if they aren’t logged into their account. 2. Only registered users of this blog can access – I would like only registered users of each blog to see it. You use this privacy option if you only want people who have been added as users to your blog to be able to view your blog content. In most cases you are better to use the password privacy option as a password is easier to remember for parents, students and other teachers than logging in with a username and password. 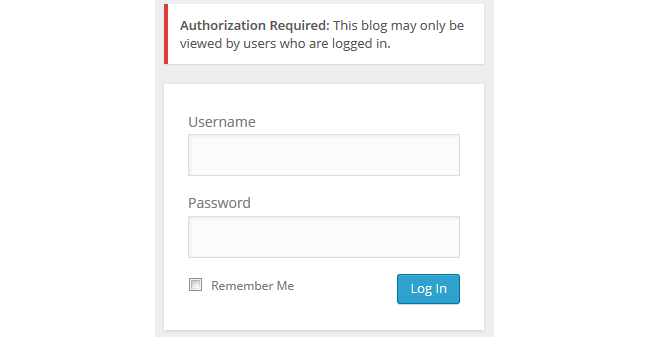 People visiting your blog will see the following notification if they aren’t logged into their account or aren’t an admin user on your blog. This privacy option is used if you want to restrict who can read your blog content to only people who know the password. This is the best privacy option to use on a private blog if you want parents, students and other teachers to easily be able to view your blog without having to log into an account. However, remember that a password is only safe if those who know it keep it a secret. People visiting your blog will see the following notification. Readers just need to add this password and click Log In to view the blog. Once you have chosen your blog privacy settings, click Save at the bottom of the page. If you have student blogs connected to your class, you will be redirected to a page and you will see your students blogs being updated with your current blog privacy settings. You can change your blog settings at any time. If you have any questions about your blog’s privacy settings, please contact Leigh Cassell. You have a unique position in that you can see the privacy settings for hundreds of student and teacher blogs in the Avon-Maitland Board. Do you notice any trends? My own class blogs are quite visible and I think this increases student motivation because they understand the size of their audience extends beyond the classroom . Thanks for your comment. It has been my experience that most teachers are excited about the idea of extending learning beyond the walls of their classrooms so their blogs are accessible to a larger, more global community. And the first step is adjusting your blog privacy settings so that the blog is “open” to others. However, as I have demonstrated to many, just because your blog is “open” does not mean that it is easily accessible or visible. For example, if you conduct a Google Search using the title of the your blog, how many search results come up? It is probably in the hundreds of thousands or millions. And the newer your blog is, the more likely it is that your blog is on the last page of those search results. So how do people find you on the WWW? Although the majority of teachers in AMDSB have blogs that are “open” or public, the next step – which is a much more challenging task – is learning how to build an audience for your blog, and maintain that audience. I will be posting some helpful tips about building and maintaining an audience in the new year and I will be inviting others to share their successes and challenges following that post. I am looking forward to reading about your perspective on that topic Becky!